From Toy to Tool: Cell Phones in Learning: SCVNGR: Cell Phone Scavenger Hunt Builder! Thank you to Jeffrey Branzburg for pointing me towards a resource called SCVNGR. In SCVNGR you can participate in or create your own mobile scavenger hunts. The great aspect of this application is that you can use it with basic text messaging (no GPS or smartphone required) OR you can use it with an iPhone! Most of the scavenger hunt type applications online only use smartphones, so it is fantastic to come across one that is more accessible (since over 60% of cell phone users still have basic phones). It is very easy to create your own SMS scavenger hunts. SCVNGR using a WYSIWYG template system to set it up. Once you set it up, students can start the game themselves OR the teacher can start the game for all the students by sending a mass text message. The hunt can be anywhere! Museums, around the city, in the school, non-fiction, fiction...etc. The hunt can also be timed or not. In addition, the hunt clues can be mixed differently for each student or group of students so that they do not arrive in the same place at the same time! In addition, when you finish creating your scavenger hunt you get a handy down-loadable handout for the students with easy instruction on how to participate in your unique game (see the one I made below)! Wow! That is a great time-savor for me. No need to make a how-to tutorial! In addition, you can include pictures in the hunt and grade the pictures via the SCVNGR website! The only negative of this resource is that there is a small cost to create your own hunt (they use credits for each game). However, they do have special fees for universities (so my guess is that a school could negotiate a very small fee). There is no cost for students to play (of course they should know their text messaging plans). When students finish a test or quiz, there is usually some downtime for some of them. They could participate in or create their own mobile scavenger hunt (for example in an English class students could answer clues about the upcoming novel or in a science class they could try to answer clues about the upcoming science unit while in their seats waiting for the other students to finish). Doing mobile scavenger hunts around the city (or at local museums) might be a nice way to keep students connected to the classroom learning goals while they are on break. Students could research local history or science phenomenon and then create a scavenger hunt for their classmates. I work for one of the UK’s leading children’s charities – I’m really interested in being able to use this type of challenge for our corporate partners, as a fundraiser. Can you help!!? Hi Mobile-phone, I'd be more than happy to chat with you about SCVNGR! Please feel free to shoot me an email at christina@scvngr.com. Thanks! I just found out about SVNGR and went right to you blog to find out more. I plan on doing the Boston Freedom Trail svngr myself in Feb. and then taking a class of high school sophomores to Boston in April. Thanks for the review. Thank you for the link. This is a great idea to incorporate cell phones and educational learning. How better to try to use the cell phone to our advantage instead of struggling with how to prevent its use in the classroom. I cannot wait to actually use this. I think I can use this tool in two weeks with one of my lessons. I cannot wait to see their responses. On a person note, my 16 year old and other students have gotten in trouble for texting in class, when they are not supposed to. We all struggle with the cell phone dilemma, by having them use it for educational purposes they will have less time or desire to text their friends. It is a nice idea… even cutting down their likelihood of inappropriate texting would be the goal. Thank you for this great idea. I think that cell phones can be used to our advantage rather than constantly fighting the students about having them in the classroom. If the students are going to have them, then why not put them to use? I believe it is one technology that most teachers fight with instead of use. I have looked at this idea and I'm very excited about trying it in my class. I think this idea will be very useful and be a positive learning experience! 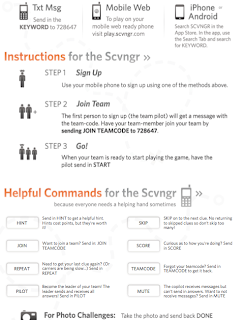 SCVNGR has unfortunately discontinued their SMS scavenger hunts. But I've been using another site, TextClues, which I'd highly recommend. The text messages are actually more responsive than they were with SCVNGR.